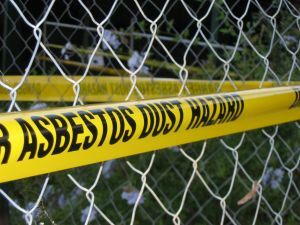 According to a recent story from WFMZ-TV News, one eastern Pennsylvania school district is planning on removing construction debris containing asbestos that was buried in the woods behind an elementary school a year ago. School officials report that construction debris (mostly residential siding material) was illegally dumped on school property during the summer when school was out of session. When school officials found the debris, they had no idea who left it there, but decided that the quickest way to deal with the problem was to have it buried in the woods behind the school. After obtaining permission from the school board, school officials had the asbestos containing debris buried in a hole lined with clay. The clay was used in an attempt to prevent asbestos from leaching into the soil surrounding the material. The new school superintendent learned the asbestos was buried behind his school when he came to the board with plans to construct a nature trail in those same woods. He was told that he should not dig near where the asbestos was buried. At a board meeting, members agreed to fund the costs of having a licensed asbestos removal company unearth and properly dispose of the cancer-causing material. This is a very sensitive project that requires extreme caution to avoid asbestos fibers from contaminating the surrounding area or being released into the air. If inhaled, asbestos fibers can become embedded in the lungs and other body organs. When the fibers become imbedded in the mesothelium layer of organ tissue, they can cause mesothelioma, which is a deadly form of cancer. The fibers can also cause lung cancer. As our Boston attorneys who represent mesothelioma victims and their families understand, the disease often doesn’t manifest itself in patients until around 20 to 50 years after exposure. Even if a person knows they were exposed to asbestos, there is nothing doctors can do to remove the deadly fibers or prevent the disease. Most victims can only wait and hope they do not become sick. The asbestos in this case is known as friable asbestos, which means that it can easy crushed by hand, and the fibers are released into the air. Once the material is analyzed and safely removed, it will be hauled away in six large dump trucks and taken to a proper disposal facility. One of the biggest challenges in mesothelioma cases involving illegal dumping involves identifying the party responsible for the asbestos exposure. However, in a situation such as the one presented in the article, your attorney could discuss the possibility of filing a lawsuit against the person or organization that improperly disposed of the asbestos once it had been illegally dumped. There have been numerous asbestos lawsuits filed against companies who improperly disposed of asbestos. Many of those cases are brought by employees of a company who were unknowingly exposed to deadly asbestos dust due to the company’s negligence in handling the hazardous material. In addition to Occupational Safety and Health Administration (OSHSA) regulations, the U.S. Environmental Protection Agency (EPA) requires that asbestos disposal be performed only by a company that has been certified in proper handling.